In Spring 2001, I met director Scott Schwartz at the opening night party of Bat Boy. It was in the middle of a huge time for him -- months before he had made his Broadway directorial debut, co-directing Jane Eyre; tick... tick... BOOM! was coming up. In the next couple of years, he was a New York fixture. Then he went away, making only a handful of returns to the New York City stage in the next decade (most recently with the acclaimed two-hander Murder for Two). Now he's somewhat close to Broadway again with another high-profile work, the stage adaptation of The Hunchback of Notre Dame. "I did three musicals in New York and really wanted to take some time to focus on doing other things," Schwartz said about his time away. "I love musicals -- they're my first love -- but, as a director, I wanted to expand my range and broaden my base of work." He did that by directing a ton of different types of pieces at regional theaters. Then, at some point, Disney called. The call wasn't about Hunchback specifically, it was more a general chat about projects. But soon thereafter the talks focused on Hunchback. Inspired by the classic Victor Hugo novel, The Hunchback of Notre Dame has a book by Peter Parnell, music by Alan Menken and lyrics by Scott Schwartz's dad, Stephen Schwartz. The father/son combo have not worked together that much over the years, which the junior Schwartz said is by design. But this one called to him. "The show is very different than the animated movie and people should know that coming in," Schwartz said. "One of the very early decisions we made was that this should be a show for adults and a show that really goes back to Victor Hugo, both the story and tone. We weren't going to make this a family musical. There is a lot of new music. There is some music that was cut from the film. The show is substantially darker." This is not the first attempt to bring this story to the stage. 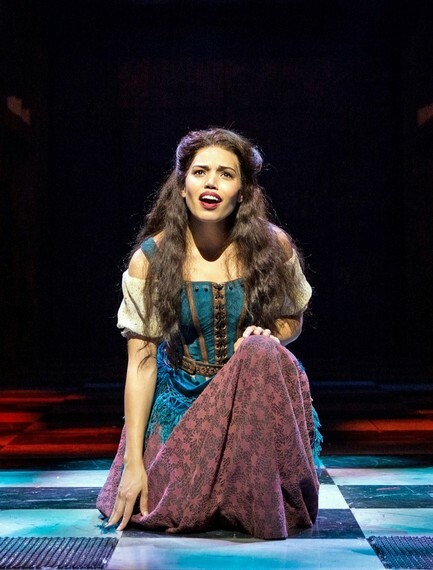 Well-known librettist/director James Lapine wrote the book for and directed a different stage musical version Der Glockner von Notre Dame, which opened in Germany in 1999. Disney has been mum on why Lapine is not working on the American version, and Schwartz claimed to not know what led to the decision. Schwartz, who did not see the show in Germany, did say he has been in contact with Lapine, who has been helpful in this version's development. The Schwartz version began its life at La Jolla Playhouse this fall and is now playing at Paper Mill Playhouse through April 5. "The physical production is quite simple," Schwartz stated. "We wanted to strip away as much artifice as possible in the show -- everything is based on classic theatrical techniques. They use the raw materials of the cathedral to realize the storytelling." The show does have a giant set, but it doesn't change much. The actors move around the set pieces when needed. Michael Arden transforms into the titular character before your eyes. According to Schwartz, the real goal was to use the score from the Disney musical movie and combine it with Victor Hugo's original, much darker, novel. He believes they've accomplished that. Each song has had work done to it and some of the lighter ones were cut altogether. The show is now complete with a parental advisory. It is unclear what the future holds for this Hunchback. Another Disney project, Newsies, went from Paper Mill to Broadway not so long ago. The same could happen for Hunchback, but then it could not. For his part, Schwartz is just enjoying the ride. His production of Murder for Two is currently enjoying a regional tour. He is also artistic director of the Bay Street Theatre, which he is trying to make a home for new works. 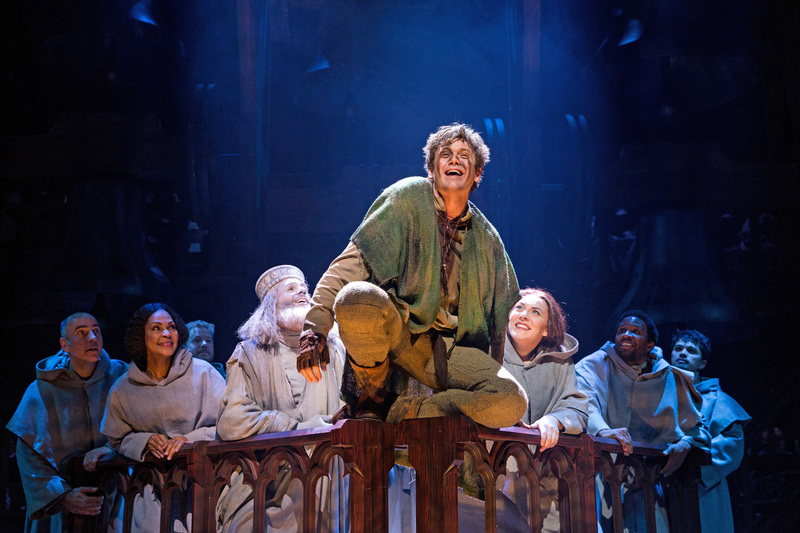 And Hunchback, regardless of its future, has been a great experience for him. "The idea was really to focus on the humanity of the piece," he said. "Being focused on that, making sure we used theatrical techniques to make that happen, has been a joy."